IGF-1, also known as Somatomedin C, has fast become a very popular and widely talked-about compound within the mid-2000s up to the current year of 2017. It has been rumored that the first official use of IGF-1 as a performance enhancing drug was in the early 1990s by then-Mr. Olympia Dorian Yates, which at the time was considered an extremely rare and expensive drug to obtain, after which its use quickly spread among other professional bodybuilders. IGF-1 is not an anabolic steroid, but is rather a protein hormone (also known as a polypeptide – or simply a peptide – hormone) that is extremely similar in structure to the hormone insulin – another peptide/protein hormone. IGF-1 is endogenously, naturally manufactured and synthesized by the human body primarily in the liver. The production of IGF-1 by the liver is stimulated and triggered by Human Growth Hormone (HGH). Essentially, HGH is a prohormone for IGF-1, and the majority of HGH’s anabolic effects are actually the result of the downstream production of IGF-1. Although IGF-1 is very similar to insulin (hence the name Insulin-like Growth Factor 1), its role is slightly different. Like insulin, IGF-1 is a nutrient shuttling hormone that facilitates the shuttling of nutrients (such as amino acids as well as glucose) into muscle cells. The cells themselves can then utilize those nutrients in order to synthesize new muscle tissue. IGF-1 is also anabolic in bone, connective, and intestinal tissues. This differs from insulin, which is a nutrient shuttling hormone in a broader sense of the word in that insulin shuttles nutrients not only to muscle tissue, but many other tissues throughout the body. In other words, insulin is not as selective of a shuttling hormone as IGF-1 is. Additionally, IGF-1 plays a very unique and very specific number of roles in the human body, and its role changes throughout human developmental phases. For example, it is responsible for various important factors involved in growth during childhood, and also expresses anabolic effects in adults. Medically, its use is primarily for the treatment of growth failure, but as IGF-1 is a fairly recent discovery in medicine, its experimental use for the treatment of other conditions continues to broaden. Its medical use and clinical research extends into conditions such as: dwarfism, aging, neuropathy, cancer, and even stroke. Various variants of IGF-1 for exogenous administration in the body have been developed for use as of late: IGF-1, IGF-1 LR3, and IGF-1 DES, and all have their different properties in regards to half-life and usage. These can be confusing to first-time potential users, especially with the vast amount of confusing information in circulation on the internet, but this will be explained further in this article later on. IGF-1 is a polypeptide hormone consisting of a chain of 70 amino acids in length. By comparison, insulin is composed of 51 amino acids in length. As previously mentioned, it is a nutrient shuttling hormone that is quite specific to muscle tissue, and it is an extremely anabolic hormone. It is also anabolic to bone, connective tissue, as well as intestinal tissues. The fact of the matter is that – as mentioned earlier – natural and endogenous IGF-1 manufacture is stimulated by HGH, making HGH essentially a releasing factor for IGF-1, hence why increased HGH dosage effects are limited by how much IGF-1 the liver can produce at any one time. This is where the advantages of exogenous IGF-1 use comes into play. IGF-1, aside from being a nutrient shuttling hormone, also acts to promote muscle cell hyperplasia (the growth and development of new numbers of muscle cells) as opposed to muscle cell hypertrophy (which is the growth of existing muscle cells in size). However, some very important distinctions in regards to IGF-1’s activity must be understood: the first is that studies have found that 99% of IGF-1 circulating the bloodstream is bound to some specific binding proteins, and free (or, un-bound) IGF-1 is what is responsible for muscle cell proliferation (hyperplasia). As a result, pharmaceutical research has discovered various methods of modifying the IGF-1 structure in order to circumvent or avoid this problem of IGF-1 molecules becoming bound by binding proteins. The results are, of course, the different variants of IGF-1 that have been developed for use. The second distinction worth mentioning is that IGF-1, no matter the variant or type in question, always works systemically in the body. This means that once administered, it circulates the whole body and works throughout all muscle tissue and does not contribute to localized muscle growth where it is/was initially administered. As mentioned above, IGF-1 is available in primarily 2 different formats/variants. It is important to remember that no matter the variant, they all work systemically in the body and that despite administration of the hormone intramuscularly directly into a specific muscle, it will not generate measurable localized growth that is worth administering it in that fashion. 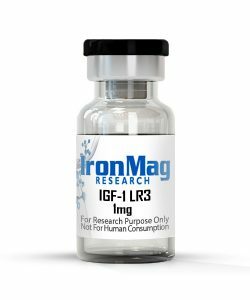 IGF-1 LR3: This is listed first, as it is the most common and very popular variant of IGF-1 on the market and in use by bodybuilders and athletes now. It contains bio-identical IGF-1 consisting of the original 70-amino acid chain, but with an additional 13 amino acids at its N-terminus for a total of 83 amino acids. It also possesses a second modification, where an arginine is located at the 3rd position rather than the original glutamic acid. The result of these modifications is that the IGF-1 still exhibits its original activity at the IGF-1 receptor in body tissues, and has a very low binding affinity for the IGF binding proteins mentioned earlier. It also exhibits a significantly extended half-life of approximately 20 – 30 hours as opposed to IGF-1’s 12 – 15-hour half-life. All of these factors combined have demonstrated LR3 to be about three times the potency of IGF-1. IGF-1 DES: Also known as DES(1-3)IGF-1, this is what is commonly known as the very fast acting form of IGF-1 and is usually the less-preferred of the two. Its modifications from the original IGF-1 molecule are such that it is missing the first 3 amino acids at the N-terminus, which grants IGF-1 DES a total of 67 amino acids in its chain compared to the original 70. This modification grants IGF-1 DES a reduced binding affinity for the IGF binding proteins mentioned earlier along with an increased strength and potency approximately ten times that of the original IGF-1, and five times that of IGF-1 LR3. Unlike IGF-1 LR3, IGF-1 DES possesses a far shorter half-life of approximately 20 – 30 minutes. Because of its faster activity and greater strength/potency, the DES variant of IGF-1 is commonly purported to achieve localized muscle growth in the site it is injected into. Although there is some truth to this, studies have demonstrated that it, like IGF-1 in general, will act systemically once it reaches capillaries and the blood stream. The side effect profile of IGF-1 and most users’ tolerance to it is generally well accepted according to studies and medical literature, as well as the feedback observed from bodybuilders and athletes who have used it. However, IGF-1, like anything, is not without its potential risks and side effects. The majority of IGF-1 side effects manifest themselves more in the form of long-term side effects and risks, which usually stem from long term use (and of course, dosage). In the short term, IGF-1 can present the side-effect of hypoglycemia (low blood glucose levels) simply due to the fact that it is, as mentioned throughout this article, a nutrient shuttling/partitioning hormone. As IGF-1 increases the uptake of glucose into muscle cells (and other cell types as well) by a rapid rate, this leaves the risk of rapidly declining circulating blood plasma levels of glucose. Although this occurs at rates far below that of insulin, it is still a potential risk and side-effect. Individuals looking to use IGF-1 who are diabetic or diabetic-prone should take caution of this IGF-1 side effect. Regardless of the potential for diabetes or not, those looking to use IGF-1 should take care to monitor their blood glucose levels and signs and symptoms of hypoglycemia, and adjust their diets accordingly. Being that IGF-1 is indeed a growth factor and a growth hormone in and of itself, it can promote tumor and cancer growth in those individuals who either have already been diagnosed with active tumors and/or cancer, as well as those who may have had a history of cancer. It is important to understand here that IGF-1 does not cause cancer. It is a very important hormone that plays important roles in the proper functioning of our heart, nervous system, and brain function among many other functions. With that being said, those who have a history of cancer or are diagnosed active cancer patients. Acromegaly and internal organ and intestinal tissue growth is a commonly discussed IGF-1 side effect as well. This usually comes with long-term excessive use, as well as unnecessarily high dosages. Acromegaly is the excessive growth of bone tissue, usually manifesting itself noticeably in the jaw, and extremities such as the feet and hands. In order for this to occur, periods of long uninterrupted use, as well as high dosages, are required. It is advised that no IGF-1 cycle (especially IGF-1 LR3) be used for longer than 30 days at a time before a considerable break from the compound. As time on the hormone goes on, and/or as dosages increase, IGF-1 receptor sites on muscle tissue become saturated leaving any excess IGF-1 in the bloodstream to bind to other tissues (bone, internal organs, and intestinal tissue) and initiate tissue growth in those tissues. Over time, one can see why and how this can become a problem (often irreversible) with high doses and extended periods of use. Dosages are as follows for IGF-1 LR3: No more than approximately 40 – 50mcg per day should be used by men, and no more than 20mcg per day for females. Because of its long active half-life in the body, the LR3 variant should only be administered once and no more than twice per day. On training/workout days, the IGF-1 dosage should be administered either just before the workout or just after the workout. It is up to the user’s preference, as either before or after is perfectly fine (as is pre-workout only, or post-workout only). If administered twice per day, the full daily dosage can be split in half between the two (e.g. 20mcg pre-workout, and 20mcg post-workout for a total of 40mcg per day). On non-training days, it can be administered at any time of the day. Dosages are as follows for IGF-1 DES: There is a little bit more variation when it comes to the dosage of the DES variant compared to LR3. For IGF-1 DES, the dosage range is upwards of 50 – 150mcg per day. Because of its much shorter half-life than the LR3 variant, higher dosages can be utilized without as much of the risk for long term effects on the body, though caution should still be utilized. It can be used in the same pre/post-workout manner as IGF-1 LR3, and is in fact commonly used in this manner because of its short half-life. Either form of IGF-1 can be administered intramuscularly, or subcutaneously. Use of either form should not exceed cycle lengths of 30 days’ total before taking a minimum of 2 weeks off, though longer breaks than 2 weeks between IGF-1 cycles are recommended. This is not only because of the risk of health effects in the long term, but also to ensure IGF-1 receptors return to proper working order following a cycle. 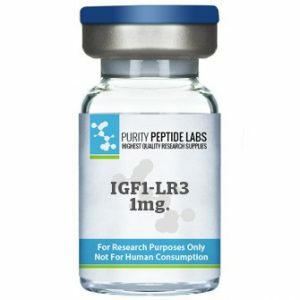 Both variants of IGF-1 will be packaged in a lyophilized powder format (a dehydrated/dried out powder) that will need to be reconstituted either with bacteriostatic water, or – commonly in the case of LR3 – a small amount of acetic acid diluted into bacteriostatic water. It is the user’s responsibility to calculate how much water he or she will have to add to the lyophilized powder in order to reconstitute it properly to form a desired concentration. Most IGF-1 preparations (both LR3 and DES variants) usually come as a standard 1mg total of lyophilized powder. As an example, if 2ml of bacteriostatic water is added to the powder, this will yield the user 50mcg per 10iu (or 0.10ml) of water. Concentrations can and will vary depending on the product purchased, and how the user wishes to reconstitute the product with any desired amount of water. It is imperative that anyone wishing to use any form of IGF-1 understands the proper basic mathematical calculations before reconstituting. The laws and legality surrounding IGF-1 across the world can vary greatly, and it is up to each individual to exercise their due diligence in researching and learning the laws of the country, state, and/or province they reside in. Laws and regulations vary a great deal between countries, and it is important to know your laws and your rights as an individual. Ignorance is no excuse for breaking the law. With that being said, most of the Western world (the United States, Canada, and the United Kingdom, etc.) do not criminalize the use or possession of IGF-1. In these countries, IGF-1 is not a controlled substance, but its status is that of a prescription-only drug (for the very few IGF-1 preparations that are deemed for use as human medicine) and it cannot be purchased over the counter as a drug or supplement for human use. IGF-1 in either of its variants (LR3 and DES) are very widely available, though very few to no human-grade preparations for use as medication exist. This is due in large part to the fact that IGF-1 is still an experimental drug in clinical trials and has not yet been deemed an official medicine for the treatment of any ailments. It is currently in use clinically as an experimental compound, and this may change in the future. For the time being, IGF-1 availability is in the form of research peptides sold by various research chemical manufacturing companies. They can be purchased legally from any number of research companies and/or from their websites. These are products that are intended for research and laboratory use only, and unless they are utilized in a research and clinical setting that is approved and sanctioned by the FDA and medical establishments/organizations, they are not intended for human use or consumption. They are not a pharmaceutical grade product, nor are they a medical product, and they are not intended for human use. As such, manufacturing standards and quality control will follow suit. Some underground laboratory (UGL) products of this compound do exist, but they are far and few in between, and should be viewed upon with scrutiny considering the ease of access to legal research-only products of this compound on the open market. As previously mentioned, IGF-1 can be purchased from research supply vendors across the world, and are usually accessible through website e-commerce purchases. Once again, these are products that are designated for research use only, and are not manufactured for or intended for human use. Prices of these IGF-1 products are available for all to see openly as advertised on these company websites, and both IGF-1 LR3 and DES normally sell in the range of $90 – $120 per 1mg of lyophilized powder. Prices will vary depending on the manufacturer and research company selling the product. Other sources include typical anabolic steroid vendors and sources, both online and offline (in-person sources) that offer IGF-1 products as well. Once again, prices can vary a great deal in these cases, but pricing normally remains within the previously aforementioned range.